We cannot forget the death of Dancehall sensation Ebony Reigns who lost her life through car accident on the Sunyani-Kumasi road. Emmanuel Owusu-Bonsu, popularly known as Wanlov the Kubolor has revealed that he has named his daughter after Ebony Reigns who was to celebrate her birthday today. According to the musician, he had a name in his mind with which he would have named his daughter after but her daughter who was born 3 days after the death of Ebony, has given his daughter the name Ebony to immortalize the legacy, strength and love exhibited by the artist whiles she was alive. 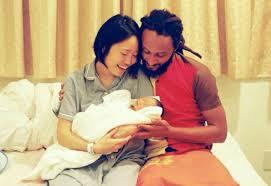 Ebony Akosua Mansa is the name Wanluv has given to her daughter. He made this known on his Twitter handle. Wanluv has 5 children already; Abonsamposuro, Mali Wasty, Ama Manpi, Tivi Lili and Kojolescu Alata Mori with 5 different women. Ebony Akosua Mansa becomes the sixth child to be fathered by half of the dynamic FOKN Bois duo.